This is where the steel pin was inserted when Scout had past rudder damage. One of the biggest concerns Brian had for Scout’s refit was whether or not he would be able to get the rudder off, have a new one built, and then re-install it. Well, Brian spent Saturday morning working on this major problem and with great success. It turns out, Scout has had rudder damage in her past life before she became a Flanagan. 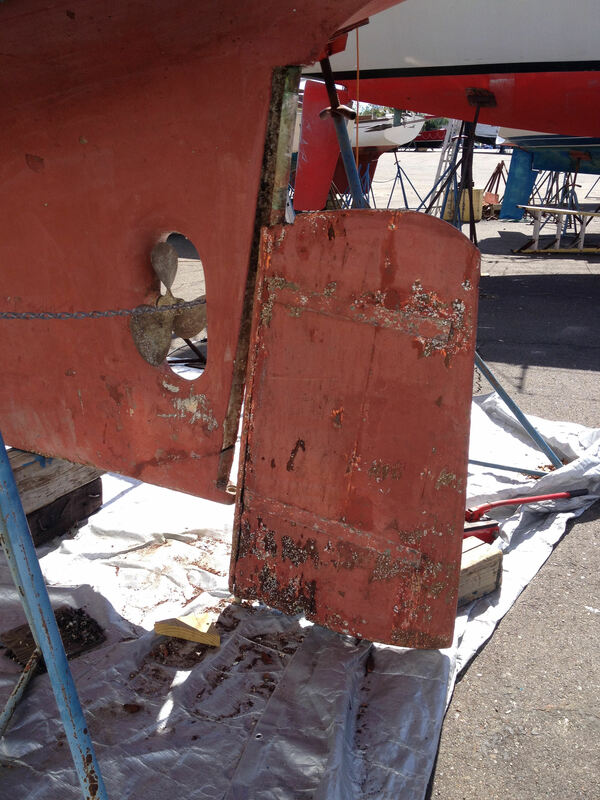 It appears that there was a hard hit on the rudder which changed the set of the rudder shaft. Some worker decided that the best fix was to drill a steel pin through the entire shaft and then ‘braise’ (kind of like sautering) the ends of the pin. This kept the shaft from dropping out of the steering quadrant and away from the boat. 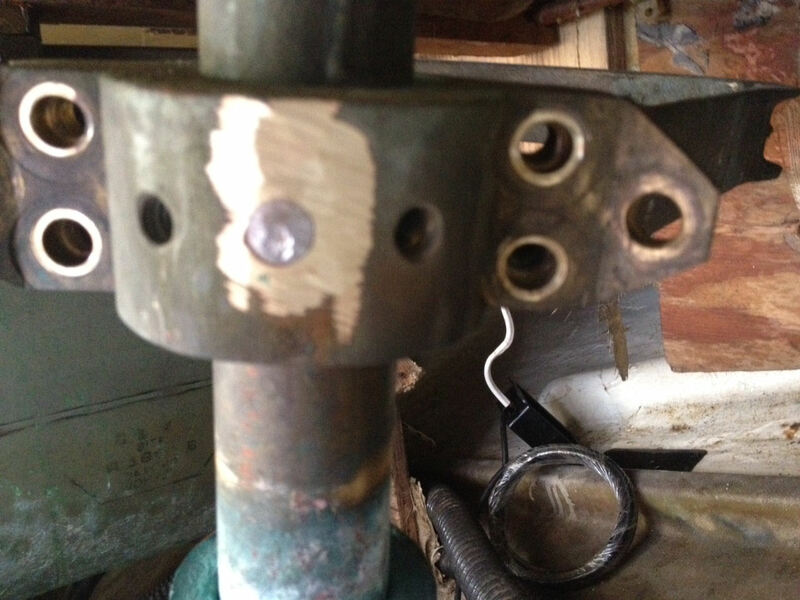 After Brian figured this out, and he did this crammed under the cockpit in a very small locker, he realized that the steel pin would need to be drilled out from the brass quadrant and rudder shaft. With that figured out, he spent a good portion of the past week making it work. On Saturday morning when I went down to Captain’s Cove, Brian was able to drop the rudder about 6 inches, and with my help and his brute strength, the rudder is now touching the ground. It is completely lose. The final piece will be having Captain’s Cove lift the boat so the last few inches of the shaft can come out of the boat. We found a maritime carpenter, Michael Whitman out of Monroe, CT, that is willing to build us a new rudder. With this major issue under control, we can now focus on getting the mast and engine removed, the hull soda blasted down to the fiberglass, and then work with a giant Erector set and build the shed around Scout for the winter work. It has been a very busy 3 weeks, and most of the interior of Scout is empty and the house’s basement is full. But so far so good. It would be so great if the rest of the refit major hurdles turned out so well. The rudder is resting on the ground awaiting for the boat to be lifted to remove it completely.